سازندهای دالان بالایی و کنگان با سن پرمین پسین- تریاس پیشین به عنوان سنگ­های مخزن اصلی برخی میادین خلیج فارس شناخته می­شوند. این سازندها با توالی کربناته- تبخیری، متشکل از رخساره­های پشته­ سدی، لاگون و پهنه کشندی هستند که در بخش­های کم­ژرفای یک محیط رمپ کربناته و در شرایط آب‎و‎هوایی گرم و خشک گسترش پیدا کرده­اند. در این رخساره­ها، دولومیتی ­شدن فرایند دیاژنزی متداولی است که از دید چگونگی تشکیل و توزیع و ارتباط آن با کیفیت مخزنی در این نوشتار مطالعه و بحث شده است. این فرایند با توجه به ویژگی­های بافتی اولیه و نیز تأثیر فرایندهای انحلال و سیمانی­ شدن انیدریت، تأثیر متفاوتی بر ویژگی­های مخزن دارد. بیشتر دولومیت­ها به­صورت جانشینی و بخشی ناچیزی نیز به­صورت سیمان گسترش دارند. دولومیت­های جانشینی ریز­بلور در رخساره­های گل­غالب پهنه کشندی، تحت شرایط تبخیر سطحی و تغلیظ آب‌های منفذی طی دیاژنز اولیه شکل گرفته­اند. در صورتی که دولومیت­های جانشینی ­در رخساره­های دانه‎غالب،­ به­صورت حفظ­کننده و تخریب­کننده فابریک بر اثر نفوذ شورابه­های تبخیری طی دیاژنز تدفینی تشکیل شده­اند. در این رخساره­ها انیدریت به‌صورت سیمان کومه­ای و فراگیر گسترش دارد.­ رخساره­های­ دولومیتی با سیمان انیدریت فراگیر، مانند رخساره­های ریزبلور پهنه کشندی کیفیت مخزنی پایینی دارند. رخساره­های دولومیتی با سیمان انیدریت کومه­ای و رخساره­های با دولومیت جانشینی­ درشت‌بلور کیفیت مخزنی بالاتری دارند. نتایج نشان می­دهد که فرایند دولومیتی ­شدن در صورتی که با ایجاد بلورهای درشت به­صورت تخریب‎کننده فابریک به‎ویژه درون رخساره­های دانه غالب همراه بوده، نقش مؤثری در بهبود کیفیت مخزنی داشته است. The Upper Dalan and Kangan formations with the late Permian- early Triassic age are considered as the main reservoir rocks of some fields in the Persian Gulf. These formations with carbonate-evaporate interval are composed of shoal, lagoon and tidal flat facies deposited in shallow parts of a carbonate ramp under the warm and arid climate condition. In these facies, dolomitization is a common diagenetic process which has been discussed in terms of the formation, distribution and its relationship with the reservoir quality. This process with regard to the original sedimentary properties, and also the effect of such diagenetic processes as dissolution and anhydrite cementation, has different effect on the reservoir characteristics. Dolomite has been mainly distributed as replacement with an insignificant part as cement. Fine crystalline replacive dolomites in mud dominated facies of tidal flats, have been formed by surface evaporation and pore water concentration in early diagenesis. In contrast, replacive dolomites in grain dominated facies, as fabric selective and non-fabric selective, have been developed by the effect of evaporate brines penetration during the burial diagenesis. In these facies, anhydrite has been formed as patchy and pervasive cement. Dolomitic facies with pervasive anhydrite, similar to fine crystalline facies of tidal flats, show low reservoir quality. Dolomitic facies with patchy anhydrite and also coarse crystalline replacive dolomites have higher reservoir quality. The results show that dolomitization when is associated with development of fabric destructive and coarse replacement dolomites, especially within the grain dominated facies, has an effective role on reservoir quality improvement. 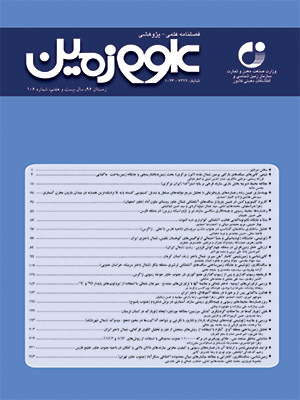 کدخدائی ایلخچی، ر.، 1386- بررسی اثرات دیاژنزی بر روی ویژگی­های مخزنی بخش فوقانی سازند دالان و سازند کنگان با نگرشی ویژه بر اثر انیدریت بر کیفیت مخزنی در میدان پارس جنوبی­، پایان‎‌نامه کارشناسی ارشد، دانشگاه تهران، 127 ص. کدخدائی ایلخچی، ر.­، رحیم­پور بناب، ح. و کدخدائی ایلخچی،ع.، 1390- فاکتورهای کنترل­کننده بافت­های مختلف سیمان انیدریت و ارتباط آن­ با کیفیت مخزنی در مخازن کربناته دالان بالایی و کنگان­، نشریه پژوهش­های چینه‌نگاری و رسوب‌شناسی دانشگاه اصفهان، سال بیست و هفتم، شماره پیاپی 42، شماره اول، صص.­ 1 تا 26. Amel, H., Jafarian, A., Husinec, A., Swennen, R. and Koeshidayatullah, A., 2015- ­Microfacies, depositional environment and diagenetic evolution controls on the reservoir quality of the Permian Upper Dalan Formation, Kish Gas Field, Zagros Basin. Marine and Petroleum Geology, 67: 57-71. Bordenave, M. L., 2008- The origin of the Permo-Triassic gas accumulations in the Iranian Zagros foldbelt and contiguous offshore areas: a review of the Palaeozoic petroleum system. Journal of Petroleum Geology, 31(1): 3-42. Dunham­­­, R. J., 1962- Classification of carbonate rocks according to depositional texture. AAPG Bulletin Memoir1:108-121. Ehrenberg, S. N., 2006- Porosity destruction in carbonate platforms. Journal of Petroleum Geology, 29: 41-52. Enayati-Bidgoli, A. H., Rahimpour-Bonab, H. and Mehrabi, H., 2014- Flow unit characterization in the Permian-Triassic carbonate reservoir succession at South Pars gasfield, offshore Iran. ­Journal of Petroleum Geology, 37(3): 205-230. Esrafili-Dizaji, B. and Rahimpour-Bonab, H., 2013- A review of Permo-Triassic reservoir rocks in the Zagros area, SW Iran: influence of the Qatar-Fars Arch,. Journal of Petroleum Geology, 36(3): 257-279. Fu, Q., Qing, H. and Bergman, K. A., 2006- Dolomitization of the Middle Devonian Winnipegosis carbonates in south-central Saskatchewan, Canada, Sedimentology, 53: 825-848. Insalaco, E., Virgone, A., Courme, B., Gaillot, J., Kamali, M. R., Moallemi, A., Lotfpour, M. and Monibi, S., 2006- Upper Dalan and Kangan formation between the Zagros Mountains and offshore Fars, Iran: depositional system, biostratigraphy and stratigraphic architecture. GeoArabia, Gulf PetroLink, Bahrain, 11(2): 75-176. Jones, G. D. and Xiao, Y., 2005- Dolomitization, anhydrite cementation, and porosity evolution in a reflux system: Insights from reactive transport models. AAPG Bulletin, 89(5): 577-601. Leary, D. A. and Vogt, J. N., 1986- Diagenesis of Permian (Guadalupian) San Andres Formation, Central Basin Platform, in Bebout, D. G., Harris, P. M., eds., Hydrocarbon reservoir studies, San Andres/Grayburg formations, Permian basin: Permian Basin Section. SEPM Publication, 86-26: 67-68. Machel, H. G., 1986- Early lithification, dolomitisation and anhydritization of Upper Devonain Nisku buildups, subsurface Alberta, Canada, in J. H. Schroeder and B. H. Purser, eds., Reef diagenesis: Berlin, Springer-Verlag, 336-356. Machel, H. ­G., 2004- Concepts and models of dolomitization: a critical reappraisal. I n: Braithwaite, C.J.R., Rizzi, G. and Darke, G. (Eds. ), The Geometry and Petrogenesis of Dolomite Hydrocarbon Reservoirs. Geological Society of London, Special Publication, 235: 7-63. Mehrabi, H., Mansouri, M., Rahimpour-Bonab, H., Tavakoli, V., Hassanzadeh, M., Eshraghi, H. and Naderi, M., 2016- Chemical compaction features as potential barriers i n the Permian-Triassic reservoirs of South Pars Field, Southern Iran. Journal of Petroleum Science and Engineering, 145: 95-113. Melim, L. A. and Scholle, P. A., 2002- Dolomitization of the Capitan Formation forereef facies (Permian, west Texas and New Mexico): seepage reﬂux revisited. Sedimentology, 49: 1207-1227. Moradpour, M., Zamani, Z. and Moallemi, S. A., 2008- Controls on reservoir quality in the Lower Triassic Kangan Formation, Southern Persian Gulf: Journal of Petroleum Geology, 31: 367-386. Nurmi, R., Charara, M., Waterhouse, M. and Park, R., 1990- Heterogeneities in carbonate reservoirs: detection and analysis using borehole electrical imagery. Geological Society, London, Special Publications, 48: 95-111. Rahimpour-Bonab, H., Asadi-Eskandar, A., Sonei, A., 2009- Controls of Permian-Triassic boundary over reservoir characteristics of South Pars Gas Field, Persian Gulf. Geol. J. 44, 341-364. Rahimpour-Bonab, H., Esrafili-Dizaji, B. and ­Tavakoli, V., 2010- Dolomitization and anhydrite precipitation in Permo-Triassic carbonates at the South Pars gasfield, offshore Iran: controls on reservoir quality. Journal of Petroleum Geology, 33(1): 43-66. Sadooni, F. N. and Alsharhan, A. S., 2004- Stratigraphy, Lithofacies Distribution and Petroleum Potential of the Triassic Strata of the Northern Arabian Plate. AAPG Bulletin, 88(4): 515-538. Sfidari, E., Kadkhodaie-Ilkhchi, A., Rahimpour-Bonab, H. and Soltani, B., 2014- A Hybrid approach for litho-facies characterization in the framework of sequence stratigraphy: A case study from the South Pars gas field, the Persian Gulf Basin. Journal of Petroleum Science and Engineering, 121: 87-102. Tavakoli, V., Rahimpour-Bonab, H. and Esrafili-Dizaji, B., 2011- Diagenetic controlled reservoir quality of South Pars gasfield, an integrated approach. Comptes Rendus Geoscience­, 343: 55-71. Wang, G., Li. P., Hao, F., Zou, H., Zhang, L., Yu, X., 2015- Dolomitization process and its implications for porosity development in dolostones: a case study from the lower Triassic Feixiianguan Formation, Jiannan area, eastern Sichuan Basin, China. Journal of Petroleum Science and Engineering, 131: 184-199. Warren, J. K., 2006- Evaporites: Sediments, Resources and Hydrocarbons. Springer-Verlag, Brunei, 1036p. Warren, J., 2000- Dolomite: occurrence, evolution and economically important associations. Earth Sci. Rev.52: 1-81.